Verbal to Visual is a project designed to help you tap into the visual processing powers of your brain. Via the blog and our courses, you’ll learn how to use hand-sketched notes as a powerful learning, problem-solving, and idea-sharing tool. I’ve put together a free set of practice activities for those who are eager to jump right in and learn by doing. (That’s the best way to build your skills, after all). Want to see what sketchnoting is all about? 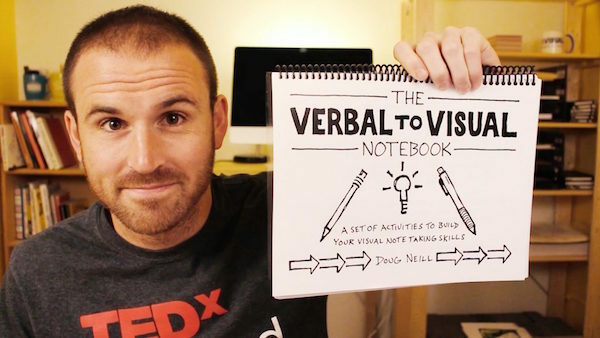 Let me send you a free sample of The Verbal To Visual Notebook! You'll get the full introduction and the first 18 practice activities so that you can get your feet wet with visual note-taking. This will also sign you up for my weekly newsletter in which I share new videos and other sketchnoting resources (you can unsubscribe at any time). Grab a pen and join us!